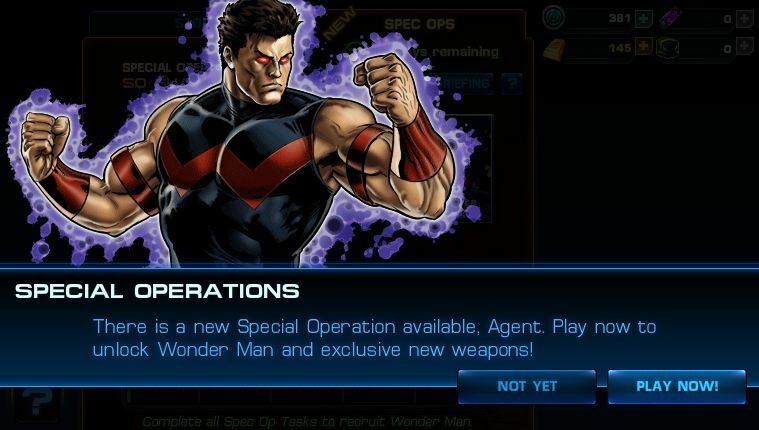 ooh neato: Marvel Avengers Alliance: Spec Ops 10 Launches! Wonder Man Up for Grabs! Marvel Avengers Alliance: Spec Ops 10 Launches! Wonder Man Up for Grabs! Spec Ops 10 has launched for Marvel Avengers Alliance! Up for grabs this time is Wonder Man, a protector who is immune to DoTs (damage over time effects)! There's another collectible box villain recruited as well: Constrictor. Unlike Spec Ops 9 which was a super-long whole month, you only have 23 days to complete this one so you might want to start saving up on Unstable Iso-8s now. Briefing - HYDRA has set their sights on Simon Williams and his company's latest Iso-8 experiments. Not only must S.H.I.E.L.D. protect New York from erupting into a full-blown battlefield, but they must also prevent Wonder Man from being brought back into the ranks of HYDRA. Bio – In a bid to destroy the Avengers from within, Baron Zemo performed ionic energy experiments on a man named Simon Williams. The experiments succeeded beyond Zemo's wildest dreams, transforming Simon into a being of superhuman strength and durability. Simon was welcomed into the Avengers as Wonder Man and became a spy for HYDRA. Later, he threw off HYDRA's control, saving the Avengers and truly becoming one of them. While his nigh-invulnerability has let him overcome physical challenges with ease, he continues to struggle with the ethics of using his tremendous gifts, endeavoring to preserve his humanity in the face of his own immortality. We are introducing yet another group boss villain to Avengers Alliance with Spec Op 10, Red Skull. Like Ultron, users will recruit their friends to help defeat Red Skull. We have made some improvements to the group boss feature since the last time players were able to participate. We have added the ability for the group boss to scale in difficulty based on the user’s level. We have also enabled a “Request help” feature on the friend selector to invite your neighbors to help with Red Skull. This should help alleviate players not knowing when a particular ally’s group boss was ready to be engaged, as it will update invited friends’ ally bar. In short if you ask a friend for help with the in-game invitation tool, they’ll be able to help you as soon as they refresh the game. Rewards have also been significantly restructured for the group boss. The new lockboxes debuting in this Spec Op will be the Coiled Lockbox (which will grant comics from Constrictor’s collection). Just like the lockboxes from previous Spec Ops, these new boxes can be obtained through various tasks and for participation in Red Skull Group Boss fights. They will have a new look that differentiates them from the previous lockboxes (which will remain available in the store, not be replaced). Just like our previous lockboxes, they will have a chance to reward a rare comic cover from our new Collection, or contain a less-rare but useful powerup or consumable. Perhaps even some old but powerful weapons! Collections are made up of 8 classic comic book covers that, when combined, will unlock a special character. There will be a “Collections” screen where players can view their collections and view which pieces they are missing. Players can then buy Lockboxes or earn them from fighting Red Skull to try to find the rest of the Collection! The new collection for the Coiled Lockboxes is Constrictor (details below). Bio – Frank Payne began his career as an Agent of S.H.I.E.L.D., but the lure of money and power drove him to crime. He donned a cybernetic suit equipped with prehensile, electrified metal coils and took on the moniker of Constrictor. After winning an excessive force lawsuit against Hercules, he had all the money he could want, and decided he wanted to return to the life of a hero... or at least a soldier with a few scruples. Distress calls will now work for War Machine with the Iron Patriot armor and Iron Man with the Mk. 42 armor equipped.